Wow…where to start? After having spent the last 9 days abroad, I can honestly say I am truly glad to be back home and pecking away on my laptop. Even though vacations are fun & exciting, it always feels good to get back into the swing of things. Back in my own bed, back with my kids and pets, back to reality. The hubs and I traveled to Paris and London last week. We had a little bit of vacation and relaxation and also attended the first ever London Produce Show–which was very boutique-like in size and quite well done. The exhibitor booths were all the same dimension which allowed for easy viewing and maneuvering throughout the show floor. There were cooking demonstrations, Q&A sessions, and produce industry speaker sessions, in addition to the expo of businesses represented. Many giveaways and a great lot of interesting and unique things to see and sample and an abundance of opportunities for networking and new introductions. This show was clearly a “winner,” and in my humble, UK-loving opinion, the venue could not be beat. With that said, I have also named another recent “winner,” here at King Fresh. While away in Europe, we had our monthly drawing for our new Grape Lover’s Giveaway section of the website. …and I am excited to announce that Mary Hall of Kentucky is our lucky winner for the month of May. 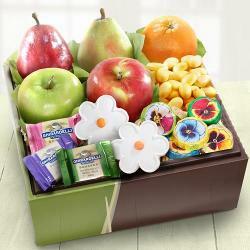 Mary will be receiving a lovely “Spring Bouquet of Sweets and Fruit Gift Box.” Congratulations go out to Mary…and good luck goes out to all entries this month! 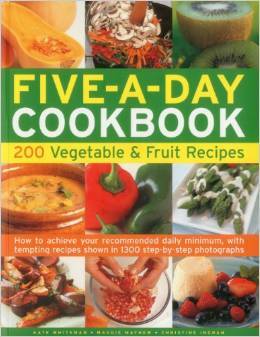 Since June is National Fruit and Vegetable Month, we will be giving away a wonderful 512 page “Five-A-Day Cookbook” featuring 200 vegetable and fruit recipes. Don’t delay–let your fingers do the walking over to http://www.kingfresh.com and enter to win TODAY! “Winner” might just be associated with your name this June! !